The sound of a cat's cough is different from that of humans. Often, owners of cats hear their pets coughing many times a day. A veterinarian, after checking the symptoms and pulmonary radiographs, classify it as feline asthma. It is a common allergic disease in cats affecting the respiratory system. The symptoms include coughing, wheezing and labored breathing. Sometimes, bronchoconstriction develops which can be life-threatening. 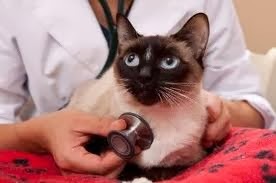 Other problems like a heart disease, lungworm or heartworm are ruled out by the vets because the cats response positively to steroids during such an allergy. Till date, no cure has been identified for the disease. Feline asthma is a chronic progressive disease that is becoming more common nowadays due to increased pollution. Though incurable, proper treatments allow a pet cat to live a normal life. 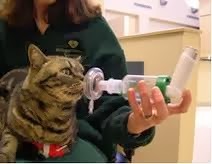 For mild cases of feline asthma, bronchodilators are used. Bronchodilators with glucocorticosteroids are used for moderate to severe cases. The oral and injected medications often have side effects like diabetes and pancreatitis. Inhaled treatments reduce such effects. Many a times, feline asthma gets mistaken for hairball attack or choking on some food. Since bronchial spasms cause the bronchi to constrict, the surrounding tissues swell and the cat falls prey to an asthmatic attack. The cat coughs constantly trying to throw out the excess mucous. It is necessary to consult a vet if a cat coughs for awhile. This helps in proper diagnosing. Like asthma in human beings, feline asthma needs proper care and caution. The pet owner needs to learn managing an allergic cat and providing it comfort. The allergens that lead to an asthmatic attack in a cat are the same ones that are responsible for attacks in human beings. Mildew, smoke, household chemicals, pollens, dust, cat litter and moist or cold air are some of the allergens responsible for asthmatic attacks. Like human beings, even cats can suffer attacks due to stress or too much exercise. It is necessary for the pet owner to be calm when the cat is suffering from an attack. The owner's tension gets transmitted to the pet as well. Early symptoms of feline asthma do not help us to detect the disease. Only a faint wheezing sound is heard. However, the cat gets tired easily. Before the onset of a severe attack, the pet's breathing gets labored. Though a full-blown attack may look like any other disease, the posture of the cat changes. The cat's body hunches lower to the ground, its head and neck gets extended out and it coughs constantly trying to clear the respiratory tract of mucous. Sneezing may or may not be there and sometimes, a cat can throw up mucous. A veterinarian uses various diagnostic tests before classifying the attack as asthma. Blood tests try to detect various infections which accompany asthma by checking macrophages, eosinophils, neutrophils and mast cells. A thoracic x-ray shows the abnormalities present like a flattened diaphragm or unusual fluid accumulation. Once the cat is diagnosed with feline asthma, it is necessary to remove it from the allergens causing the attack. The surroundings need to be kept clean from dusts and chemicals. Steroids and bronchodilators can also provide relief to the cat.